As you can see, Mike and I had quite an adventure this January. New year and a new vacation! We started off in Phoenix, Arizona, with Mike’s family who have a house there. We went swimming, toured the Olive Mill and went to a college football game called the Fiesta Bowl. Go Baylor Bears! The weather was nice but it cooled off at night to a point that we were wearing jeans and hoodies. We were warned about the temperature at least and packed accordingly. I even got to learn a new game with dominoes! I absolutely love a good board game. One that doesn’t end in a family war is best. We also tried fresh orange and grapefruit juice which was delicious! The difficult part was we had to also pack for Mexico. Our suitcase was split down with middle: desert winter weather clothes on one side and sunny beach clothes on the other. Somehow, we were able to fit everything into one checked suitcase and two carry-on bags each. I’d like to think we are pretty talented since our trip went from Jan.1-17 and we shared a suitcase! After fun with Mike’s family we hitched a ride to Las Vegas via my Aunt Ro, Uncle Bernie and cousin Janissa. They were in Phoenix, so we met up with them and began a four-hour road trip through cactus country. On the way we stopped to grab photos next to cacti three times our height and grab gross fast food. I will admit I ate the chicken nuggets from McDonald’s but it was out of pure need to eat and not a positive culinary choice. At least the honey mustard sauce was good. And yet, I think road trips require at least one greasy food stop along the way. It just has to happen. After catching a glimpse of the Hoover Dam and snapping some photos of the countryside we found ourselves in Las Vegas. Sin city. ba ba baaaahhhh! My Aunt had booked us for 4 nights at the Plaza Hotel which is located on the Old Strip. We met up with my grandparents who were staying on the Old Strip as well. This leg of the vacation was part of my birthday present as well because my grandparents had said they wanted to take me to Vegas when I turned 21. 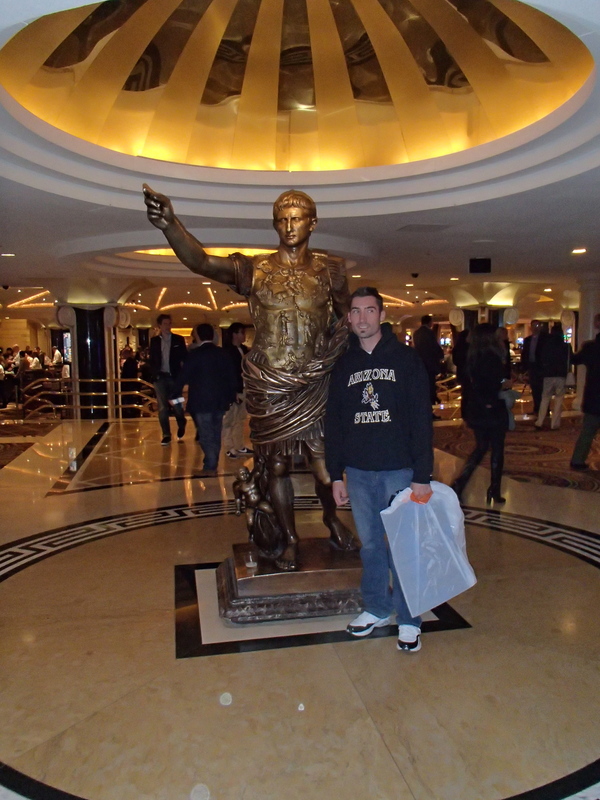 We gambled a little, ate a lot and took in as much as we could during our stay. Mike and I took one day to go check out the New Strip. We bought bus passes and headed on over. Those bus passes were priceless after we discovered how far apart each hotel was from one another. The walking could have easily tired us out in a matter of hours if we didn’t have the buses to ferry us to each hotel. Mike wanted to check out the Bellagio water fountain show and Caesar’s Palace. I wanted to see Mandalay Bay and the M&M Store. We did it all and then some since there were other hotels close by. We bought tickets to the Cirque du Soleil show called KA’ (martial arts and sword fighting) and bought an awesome batman painting all done by a spray-paint artist on the street. I freaked out when we went into the M&M store which has 4 levels of crazy. I only bought coconut M&M’s and took lots of pictures with the life-size versions of the peanut and regular chocolate M&M characters. SO COOL! On the Old Strip we also bought another painting of a Japanese cherry blossom tree and watched the light show that goes on every night. After talking to locals we found a great movie theatre to go watch 47 Ronin. The cab ride was $25 but the movie was worth it! The entire theatre was tricked out with reclining lazy-boy style chairs with cup holders. No one kicked the backs of our seats and we didn’t have to share an armrest with anyone else. It was pretty darn awesome. After four days of Vegas we were ready to go to Mexico. We boarded our super early flight after grabbing a shuttle from the hotel and jetted off to warmer places. I forgot to mention Vegas was a bit colder than Phoenix so jeans and hoodies were the wardrobe of choice. Cue arriving in Cancun, Mexico. We get through customs and hop in a shuttle van to drive to our hotel the Grant Sunset Princess Resort. Little did we know our driver used to drive in the movie Fast & Furious…or so I thought at least. We had a few other people from different hotels to drop off in the shuttle as well. This guy from New York starts chatting with the driver and we zoom a good 6 meters past the entrance to our hotel. Mike is about to say something when our driver slams on the brakes and proceeds to back up in a lane full of moving traffic. Needless to say I was hoping we didn’t have the same driver for our return drive to the airport. Following our bumpy and life-threatening ride we arrive at the hotel and realize the place is huge! Our room is a quick jaunt down the path and the beach is another adventure to get to as well. We got there at night so we walked around and thought we had the place figured out. We did not realize the hotel was so large it mirrored itself. There were actually two lobby’s which looked identical as well as a lobby bar with identical furniture, orientation, etc. Confusing beyond belief! Eventually everything was figured out and we set out to meet up with the Sunwing representatives, with whom our trip was booked through. We ended up booking two excursions with them as well. One to the Mayan ruins called Coba and a snorkelling trip on the Mayan Reef in Puerto Morelos. We also booked a shuttle to Playa del Carmen, to meet up with some friends who were staying close by. Now I have a warning for every person who travels to this area of Mexico. Part of our free shuttle deal was that we had to stop by a jewellery factory/store first and take a tour. We did and we bought something each. Little did we know the company was a big fraud scandal used to trick tourists. Our lesson was a cheap one but another group who went on the shuttle with us bought $1000 worth of merchandise and there was a no-refund policy. The factory was called Matis Jewellers. Also, do not buy anything from a store called Lapis. They are both fraudulent companies making money off fake jewellery. That was honestly the only low of our entire trip. Now onto better times. The great thing about our resort was it was all-inclusive. We never had to worry about food or drinks. There were bars all over the resort and 4 buffets plus 6 reservation style restaurants we could go to eat at. Plus, the was a span, gym, and daily activities. We tried out the archery the one day and almost checked out tequila volleyball but decided to just go chill out at one of the swim-up pool bars instead. 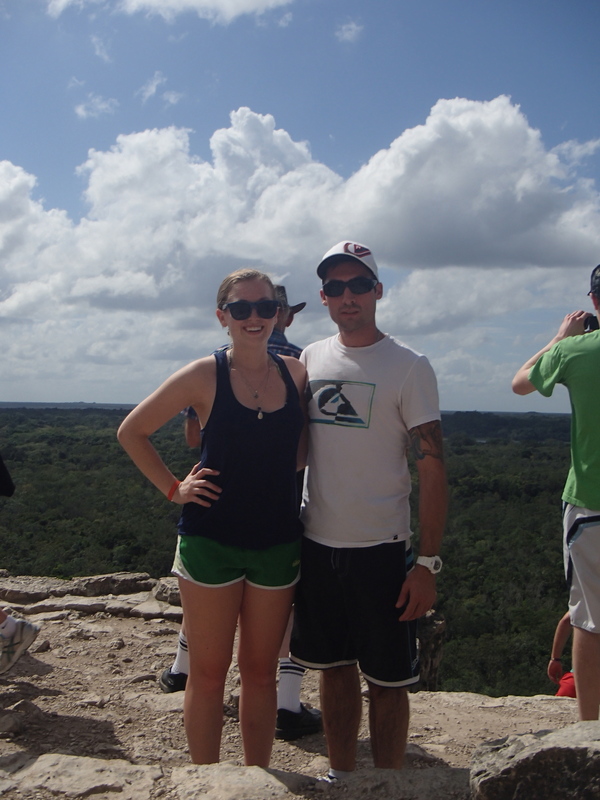 Our Coba tour was amazing and we both climbed right to the top of the ruins. It was a long day but worth it. 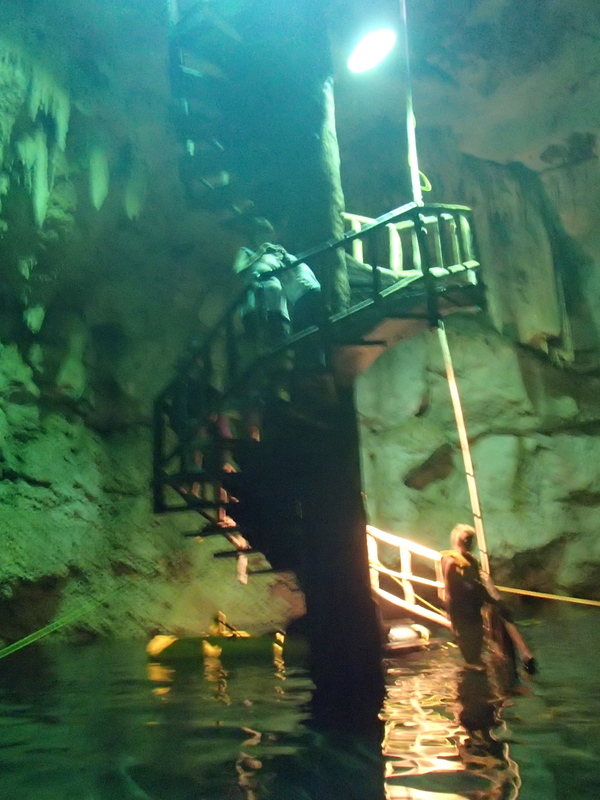 Our guide also took us to an underwater lake where we swam around and cooled off. We also went to a Mayan village where we met the locals and watched a shaman perform a ritual asking their Gods for rain. The snorkelling tour was a little less exciting but still fun. Mike had too much tequila the day before so he stayed on the boat and I went to check out the reef. We blame the college girls from Wisconsin haha. There weren’t a lot of fish like I had seen in Maui or like Mike had seen in Cuba but there was still a good number of marine life to be seen. We only did the half day trip and it was more than enough time spent out on the ocean. Other than the two trips and our visit with friends in Playa del Carmen, we stuck to the resort. We walked up and down the beach looking for shells and enjoyed all the sun. Apparently, the week before we arrived the rain had been pouring like crazy! Maybe too many shaman’s had performed the rain ceremony. Either way, everyone we met who had been there for the week before were happy the sun was back. Most of the people we met were from Canada. Mostly Alberta and some from Toronto area. I know I mentioned the great thing about all-inclusive was partly the drinks, but really it was great. If someone ordered a round of shots they were free. If we wanted two more slushy drinks and another rum and orange juice there was no extra cost. If we wanted to meander our way over to grab a snack at the buffet we could eat whatever we wanted and not price it all out. It’s a lot easier to hang out and have a good time with people when you’re not running a mental tab of all the money so many drinks and food consumed would cost. I would say our time in Mexico was probably the least stressed out I have ever been. A person learns to relax. One day we spent all day in one of the pools. I think we sat down at 10AM and didn’t leave until 4PM. Albeit, we got a bit too much sun that day but we weren’t worried! Cold shower and nap was all it took for us to be ready to go. A week in Mexico was great. We had fun and by the time we left it felt like it was time to go home. Four days in Vegas was definitely enough. I bet we could have spent more time in Phoenix and had some more fun with Mike’s family. They said there was so much more to do. I hope we can go back there! All in all our first vacation together as a couple was a success. We took pictures, bought a cheesy souvenir from every place we went and met up with great people along the way, and we didn’t kill each other! Big bonus! I can’t wait for our next adventure abroad. P.S. I only put up a few photos for the blog. If you want to see all my photos you can check out my Facebook page.